C'est une manucure simple. Is that close? Does that say "this is a simple manicure"? If not, that's what it's supposed to say, but since I've never spoken a lick of French, I relied on my Mac's dashboard widget to translate for me. Why is it in French? No, not because I'm trying to broaden my horizons or plan on traveling to France (or Canada) anytime soon. It's in French because today's manicure is a simple French manicure. Oh Katy, you're so clever! It's nothin' fancy or schmancy, but it makes my nails feel longer. I used only two colors for today. China Glaze's Good Witch and Sinful Color's Bad Chick. I freehanded the French tips, but maybe I should've taped for more consistent, straight lines. Simple, to the point, and easy to take off later to make way for a better manicure. Ahhwww this is so pretty! NO way I prefer the slightly curved, not perfect french tips-so much nicer that straight tape!! I love this!!! Well that's good to hear! In person, the white tips are a little goopy, so maybe that's what's bothering me about it. Taping seems to remove the goop, but is also super difficult on shorter nails. Glad you like it though (even though it's pink and has glitter)! 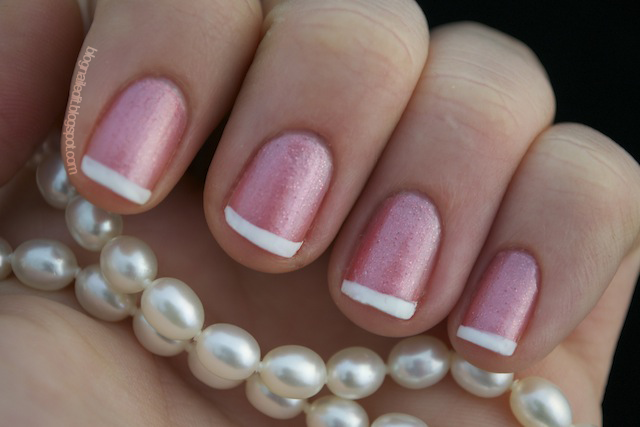 I love a simple french mani, so classic and clean!